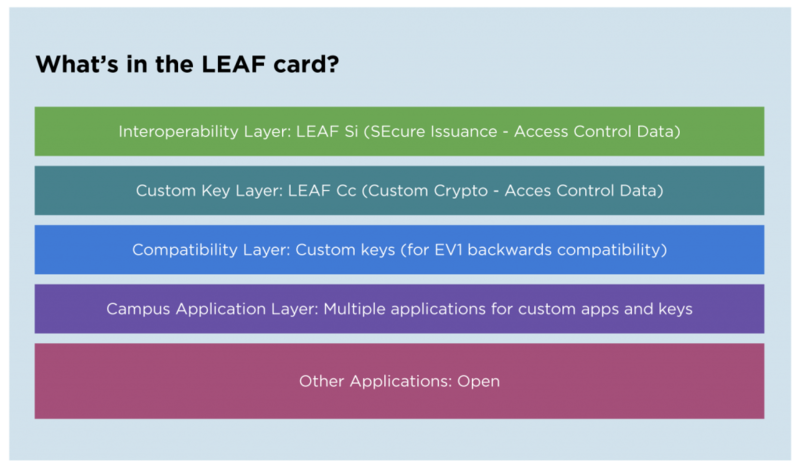 LEAF was created by industry members to provide open protocols and allow free access to technology specifications to simplify the integration of new and open technologies. The vision is to make accessing smart cards seamless and allow secure reads on the readers which should be fully portable to other devices. LEAF is providing the tools to make such concepts a reality and the support to make the adoption simple by providing the highest possible value to the end-user. Every end-user vastly benefits from interoperable products. LEAF products have one sole mission… interoperability. LEAF can provide all the definition and support necessary to achieve maximum standardization. For the security industry, this means defining a standard data structure for the latest smart card technology. The LEAF smart card design supports the most advanced security features, and a truly open multi-application structure. LEAF is a smart card usage definition based on a completely open and clearly defined data model for compatibility with every RFID device. Card data is protected by multiple cryptographic keys allowing secure access by independent devices. The end-user has the option to own their keys. With an open protocol definition, the end-user is free to use the vendors of their choice. For more information on LEAF cards call us on 1-800-810-4959 to speak to one of our experts!